My Mom: The first person I laid eyes on, the first person to guide me by the hand, my first love and my first model of leadership. While I didn’t know it as a child and disregarded it as an adolescent, my Mom taught me a lot about leadership. Like most great leaders, she never sat me down and said: “Now, I will teach you about leadership.” She just led by example: Lesson #1. When I sat down to draft this post I had a few ideas and thought it would come together easily. Yet, the more I pulled on the threads of memory, the more I had to say, the longer the list became, the more it related to leadership theory and the less I knew how to organize it all. In the end, I think it breaks down into some big themes and some common wisdom that applies to all leaders. Elaine O’Rourke will never be on the cover of Forbes or Fast Company but here’s my tribute to my Mom’s leadership style. For what is leadership if not the ability to exert a lasting influence on others? Servant leadership: I can’t tell you the hours my Mom spent driving my three sisters and me around, typing endless high school papers, not to mention the endless hours of cooking, cleaning, shopping, doctor’s appointments, etc. You really can’t appreciate all that devotion until you are a parent yourself and understand that, just maybe, there were times when she would have preferred to do something else. Through it all, I don’t remember any complaints, it was always done to support our pursuit of the day. We think of it as typical “parent stuff” but it prepares us to be of service to others so that they can meet their objectives. Motivation: Parents know instinctively what motivates their children. Is it the promise of a reward or the threat of loss? Is it “eat your dinner and then you can have dessert” or “if you don’t eat your dinner then there will be no dessert”? Different approaches work for different people under different circumstances and my Mom seemed to know how to recalibrate. Regardless of the circumstances, she always offered plenty of praise, mostly sensitive feedback and unbelievable chocolate chip cookies. Setting positive norms and values: There is lots of research about optimal organizations being those where peoples’ values align with those of their organization. Those values come to life through behaviours and “how we do things.” In our home there was respect for authority, there was kindness, honesty, good manners, taking pride in yourself and there was a solid work ethic. Of course I groaned every time I heard: “If you’re going to do something, do it properly,” but it has served me well. The importance of celebrating: Oh the feasts! 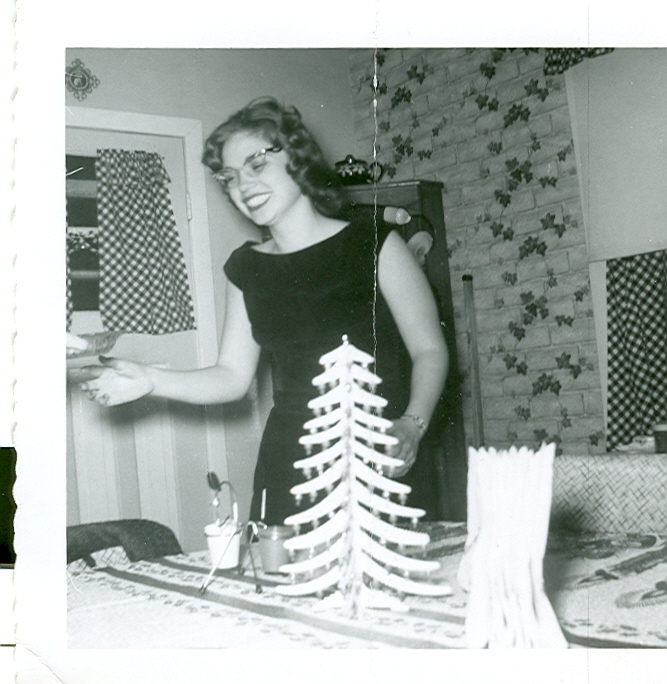 My Mom (and Dad) knew how to throw a party. Every holiday, every birthday, the more the merrier and the effort they put into these celebrations let people know how special they are. They were fostering lasting family and community ties and creating a common history. I learned later in reading Shackleton’s Way: Leadership Lessons from the Great Antarctic Explorer how important it is for people to eat together, to get to know one another and to celebrate milestones and holidays. It creates goodwill among team members which can be critical during challenging times. Perseverance: When I was an infant, my Mom discovered that she had advanced kidney disease and was told she should get her affairs in order. She wasn’t going to leave her husband with four young girls at home without a fight so she made arrangements to go to the Mayo Clinic. There, she discovered that she had been misdiagnosed but would need a transplant to survive. It was quite unheard of to challenge a doctor’s authority in those days and the church was not sold on transplantation either. She was undeterred. After some time on dialysis a donor was found and that gift kept her alive for more than twenty years. This wouldn’t be her last health challenge. During one health scare, Mom received a blood transfusion tainted with Hepatitis C. She fought for years to prove it and to obtain the compensation to which she was entitled. She knew she’d been done wrong by and, ill as she was, she was quite literally not about to take it lying down. She was eventually compensated by the federal and provincial governments but she did not live to see that day. There is so much more to say but I think I’ll close with more “comMom” wisdom that I use every day. I asked a number of friends what their Moms taught them about leadership and the conversation was fascinating. Stay tuned for those insights in a follow-up post. Until then, what did your Mom teach you about leadership?